The plasmid pUFZ75 conferred constitutive GFP expression on the bacterial pathogen Xanthomonas euvesicatoria (syn. X. campestris pv. vesicatoria). 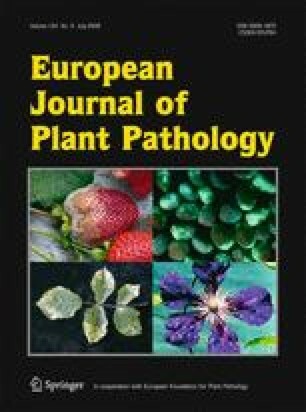 Colonisation of the tomato phyllosphere and invasion of tomato leaves by X. euvesicatoria was examined using both fluorescence and confocal laser scanning microscopy. Xanthomonas euvesicatoria established a limited population on the tomato leaf surface, primarily occupying the depressions between epidermal cells and around the stomata, prior to invasion of the leaf via the stomata and subsequent growth within the substomatal chamber and the leaf apoplast. Additionally, hrp-gfp fusions were used to report on the temporal and spatial expression of hrp genes during epiphytic colonisation and invasion. Xanthomonas euvesicatoria cells carrying hrpG- and hrpX-gfp reporter constructs were not fluorescent in vitro on non-hrp-inducing LB agar but did exhibit a low level of fluorescence on the leaf surface within 24 h of inoculation, particularly in the vicinity of stomata. Cells carrying hrpG- and hrpX-gfp fusions exhibited high levels of fluorescence 72 h after inoculation in the substomatal chamber and the leaf apoplast. Cells carrying the hrpF-gfp fusion were slightly fluorescent on LB agar and showed no further increase in fluorescence on the leaf surface by 24 h after inoculation, but did show a significant increase in fluorescence 72 h after inoculation in the substomatal chamber and apoplast. The apparent low-level induction of the regulators hrpG and hrpX on the tomato leaf surface may suggest that some of the genes of the X. euvesicatoria HrpG/HrpX regulon are up- or down-regulated prior to invasion of the stomata while still on the leaf surface. The authors wish to thank Steven Lindow for hosting three of the authors (EMC, JBJ, and MW) during the CLSM, and Denise Schichnes and Maria Brandl for assistance with CLSM. The authors also wish to thank Steven Lindow, Maria Brandl, Johan Leveau and the anonymous reviewers for constructive criticism of the manuscript. This work was supported by a USDA NRICGP grant (#9735303-4940) awarded to Wilson and Jones and additionally by funds from the Howard Hughes Medical Institute awarded to The Colorado College.